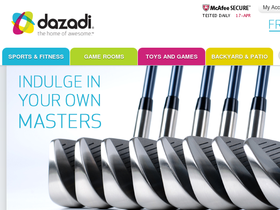 Dazadi, online at dazadi.com, is the shop for awesome sporting goods and games. Dazadi carries sporting goods for a large selection of sports, including badminton, soccer, archery, basketball, softball, racquetball, street hockey, tennis, and much more. Dazadi has games, a large selection of exercise equipment, billiards, darts, jukeboxes, arcade games, board games, arts and crafts, puzzles, hammocks, patio furniture, pools toys, and many more items to spark playfulness and fun in both kids and adults. Dazadi carries brands like Guidecraft, FreeMotion, Goalsetter, Harvil, K'NEX, MacGregor, Champion, and more. But before you shop, get all the latest Dazadi.com discounts, Dazadi promotions, and Dazadi coupon codes found here at RetailSteal.com. Dazadi offers free shipping on all purchases within the Continental United States. See site for more information. Shop at Dazadi and enjoy $15 savings on orders $250+. Click here for code. Shop at Dazadi and enjoy gifts for under $49. Click here to shop. Shop at Dazadi and enjoy free shipping on all orders delivered within the continental United States. Click here to save big on exercise equipment, toys, sporting goods, and more. Shop at Dazadi and enjoy $10 savings on orders $150+. Click here for code. Shop at Dazadi and enjoy $40 savings on orders $500+. Click here for code. Shop at Dazadi and enjoy exclusive promos with email sign up. Click here to shop. Shop at Dazadi and enjoy 5% savings on Toys and Games. Click here for code.